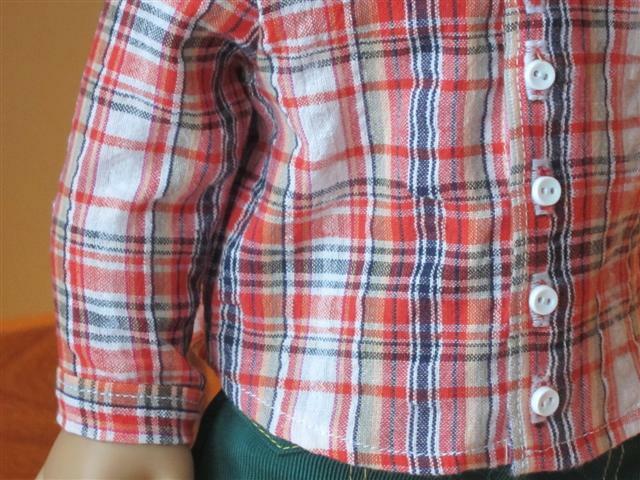 By special request I made another plaid button up shirt. This one is for Evie who loves orange. The closest looking doll I have for modeling this shirt is Ivy, and I think the coloring is just right for her. 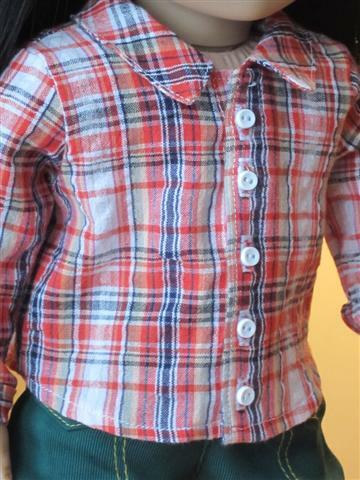 I'm sure Evie will look fantastic in her new shirt. The buttons are 1/4" size and are completely functional. The collar is just the right size. 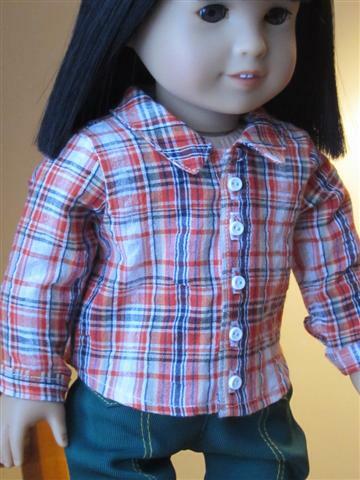 I dislike when doll collars extend to the shoulders, it has to be proportioned and realistic. Right about this time I lost my sun light. I have also made a couple of coats similar to the light brown/coral one I posted about last week. One of these coats is for a swap I am doing with a local mom. The other is either for my personal collection or I may put it in an etsy shop. I know I keep saying I'm going to open an etsy but I think this week I really should. I have a few things ready to list. I'm going on a trip to NYC in April and it sure would be nice to have some spending money while I am there. 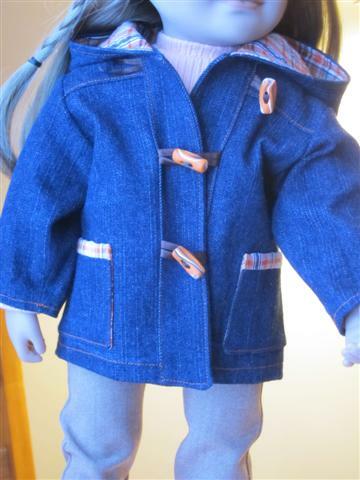 Anyways, here is one of the two nearly identical coats I made. The only difference between the two is that the sleeve lining is light blue in the one for my swap friend. The other one has plaid in the sleeve just like the rest of the lining. I'll take better pictures of the coats tomorrow when the sun comes back. Leonie is modeling. She is a Maplelea girl and I promise you she does not photograph well, especially in this poor lighting. I will get nicer pictures of her tomorrow, she truly is lovely in person. My Leonie has an identical cousin who is also named Leonie, imagine that. 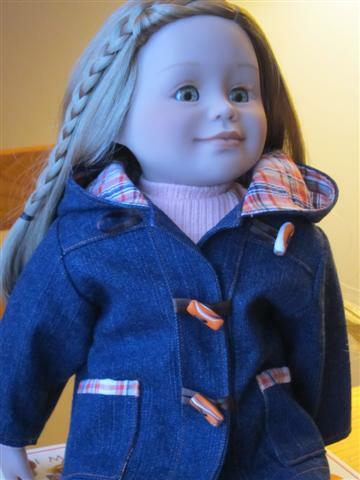 She lives in our city too, both of the Leonie dolls were ordered at the same time. 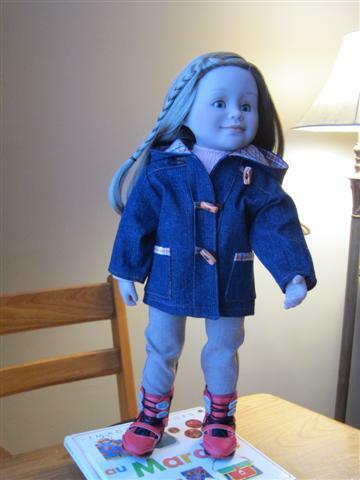 The owner of cousin Leonie has been concerned that her doll hasn't got a coat and it's been very cold here. -28 today, brrrr! Too cold to go out without a coat! 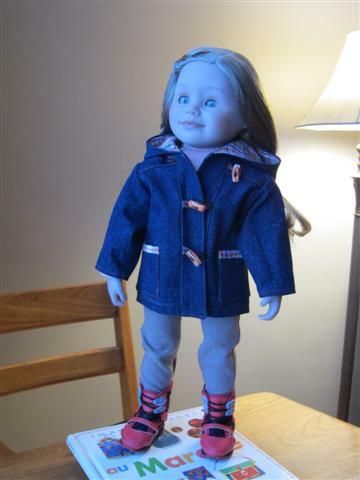 I offered to do a sewing swap with her so now our Leonies will have matching coats and they will be warm. The plaid in these coats it the left overs from Evie's shirt. The denim is very dark blue, but this whole picture is really washed out. I made these toggles out of sculpy. I mixed some dark blue and marbled it with some white and orange to coordinate. This picture captures how cute she is a little better. Her wig is incredible quality, I'm so glad I got her! I wasn't sure about these Maplelea girls based solely on pictures, but I am really happy I gave them a chance. These are her snowboarding boots, I love them! 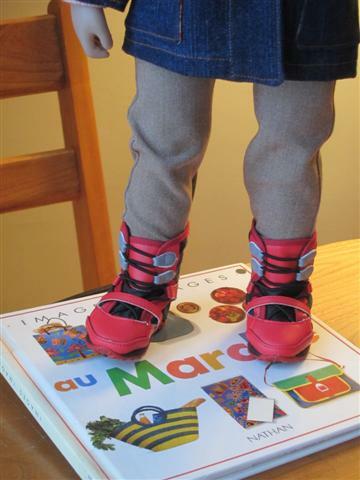 Leonie is the French Canadian girl in the series, I thought it appropriate to stand her on my son's school books. The desk she is standing on has a slanted top so I usually have to make a level platform out of a couple of books. Finishing touches and a new sweater. An almost O+S school days coat.